taeisme and Just_Me_D like this. Took 20 minutes from start to finish. Frehley, joemd60 and Danny8200 like this. taeisme, Frehley, joemd60 and 1 others like this. That has to be the fastest download and install ever, especially on the horrible wifi here at work... 23 minutes from start to finish! Vrrooooooooooooooooom! edited to correct the number of minutes! It was 23 not 13, which is still pretty darned good! Last edited by Annie_8plus; 03-26-2019 at 09:01 AM. Tartarus, Frehley, Spencerdl and 1 others like this. the information about your device seems to be better organized (arranged in groups by related subjects). Also, there’s a separate warranty status tab that you can tap to see what you currently have for a warranty, and it will show you the estimated expiration date of your warranty. There was also a carrier update as well (Sprint). I was on the public beta on my X and decided to check for the update, and to my surprise there was a 2.76GB update. I downloaded and installed. Checked my 8Plus running the developer beta 6 of 12.2 and there was no update available. Just wondering why the two different scenarios. Running great on both devices...going to update the IPP next. joemd60 and Lee_Bo like this. Woohoo! Back on official and off betas. Lee_Bo and pr1nce like this. Lee_Bo and Frehley like this. I’ve been off betas for a few months. 12.2 is running very smooth on my XR. My iPad updated quickly and without issue! So far, So smoothie . Same here for my Xr. Was fine on beta 5/6 but was glitchy on beta 3/4 if I remember correctly. Edit: if I switch over to news + (haven’t subscribed or anything) let it load then switch back it works normally. 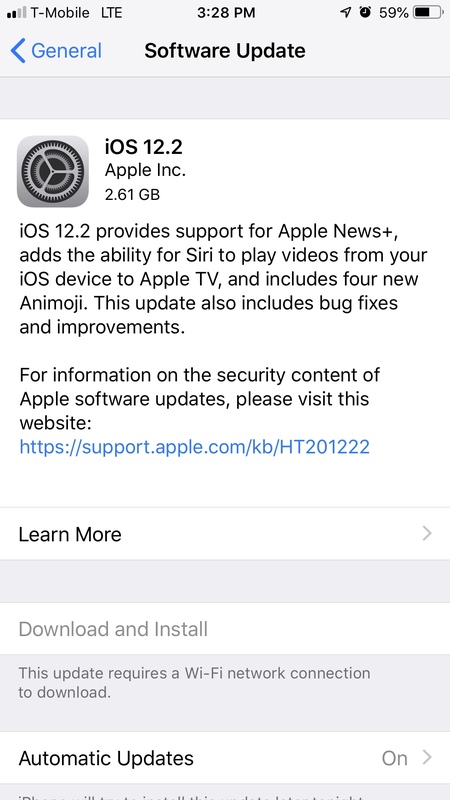 So how do you get off 12.2 beta. Is the version that was available yesterday not the GM then and doesn't it automatically replace the beta profile? The official showed up on mine yesterday with the beta profile, but just to be safe, go to general>profile and delete the beta profile and then check for updates. So I was on the beta program but wanted to get off it so after 12.2 beta 3 I uninstalled the beta profile from my iPhone. When 12.2 official dropped yesterday and installed it overwrote 12.2 beta 3 and put be on 12.2 official release.